I am heading out to get this as soon as I click POST. Tom Waits guest edited the 200th issue (July 2010) of MOJO magazine. FREE CD! STEP RIGHT UP! 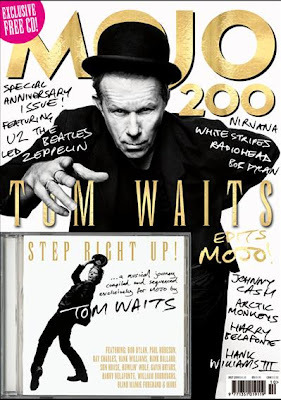 : A 15-track musical journey compiled and sequenced exclusively for MOJO by Tom Waits! Starring Bob Dylan, Howlin’ Wolf, Ray Charles, Harry Belafonte, Cliff Edwards, Big Mama Thornton, Prisonaires, Hank Williams and many, many more.